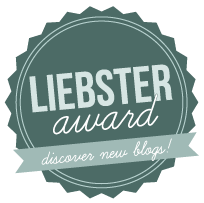 I was nominated by my fellow author, the amazingly talented Chantal Boudreau, for the Leibster Award. “What is that?” I asked. “Dunno,” she said. “Just do it, `kay.” Actually, she didn’t say that, but I just can’t help but tell stories. As you continue reading, I’m clearly one of the must boring humans on the planet. 1. Thank the person who nominated you. Thanks, Chantal! 2. Post eleven random facts about yourself. 3. You answer the eleven questions asked by the person who nominated you. 4. You think of a new set of eleven questions and nominate eleven others to answer them. 1)–My folks thought I was “Mentally Challenged” as a lad for my inability to keep up with my studies. My teachers agreed and suggested DRUGS to fix my issues. After two years of mind-altering DRUGS, Darth Vader finally discovered my problem. I came out of the theater crying: “I couldn’t see anything!” I babbled. A trip to the eye-doctor and a pair of glasses later, I was fixed. 2)–I used to play ice hockey, goal tender. I’ve been knocked unconscious three times and the one-and-only time I’ve been in a hockey fight … was with a girl. 3)–A trip to a Turkish Brothel was one of the coolest experiences of my life–not to mention one of the most expensive. 4)–During my time in the Air National Guard, I was inches away from being sucked into the intake of a running F16. 5)–I’ve had a loaded gun shoved into my face twice in my life: once by the FBI and once by the Body Guard of the Prince of Saudi Arabia. 6)–I barely missed the following catastrophic events: The F5 Super-Break-out Tornado of Xenia, Ohio (1 Day), the 1989 Loma-Prieta earthquake: (3 Weeks), and 9/11 (1 Month). 7)–In an abandoned YMCA, I managed to dodge metal girders falling from the crumbling ceiling only to fall into the drained swimming pool in the center of the room. 8)–I was once engaged to a woman 20+ years my senior. 9)–I have a mortal fear of spiders, yet I have a recurring dream of sticking my hand into a tank with a tarantula and letting it bite me. 10)–While cutting through a field on my way home from school, I was chased by an Arabian Horse and bitten in the rear-end as I scrambled under the fence to get away from him. I haven’t liked horses much since. 11)–I’ve been to five places the Ghost Adventurers have been, and I haven’t experienced a thing. 1. What was your favourite childhood show? Gilligan’s Island. Still one of my favs. 2. If you could be a bird, what bird would you be and why? Common Nighthawk–just because the name is cool. 3. What is the best dessert you’ve ever eaten? I’m pretty boring when it comes to deserts. Simple yellow cake with creamy chocolate frosting–or, if I’m feeling frisky, strawberry frosting. 4. If you could pick band line-up for your ultimate concert, who would you have open, follow and headline? I’m totally not into concerts. If I had to pick–Lady Gaga would open for Adam Ant. 5. What would you say is your favourite book outside of your preferred genres? I hate to say it, but I loooove Great Expectations by Charles Dickens. I just love it. 6. If you had to sit through the goriest of horror movies of the sappiest of chick-flicks, which would you pick? Gory horror films actually bore me. Probably the goriest film I’ve seen that I enjoyed was John Carpenter’s “The Thing”. My fav Chick’s Flick must be Moulin Rouge by Baz Luhrmann. I actually named the planet Bazz after him. 8. What is your favourite board game? Talisman by Game’s Workshop. I have all the expansions and they’re worth a fair amount of money these days. 9. If you had your choice, quiet night at home or rowdy night out? Home. I’m not much a of Bar-Guy. 10. What are the top three colours in your wardrobe? Blue, green and white. 11. Have you ever read anything you were expecting to dislike but to your surprise you loved it? Not that I can think of. If I think I’m not going to like something, I pretty much always don’t. Now comes the hard part–I’m supposed to forward this to 11 more bloggers. Problem is, Chantal knows pretty much the same list of bloggers that I do. I can’t think of 11 more to send to. In LoE Book VII, Against the Druries, the destination of Paymaster Stenstrom and his friends, Private Taara and Lord A-Ram is the planet Bazz. Let’s learn a little bit more about Bazz. Bazz, like many League worlds, was terriformed from a lifeless body to a fully functioning ecosphere in 744ex, when the planet shed its technical designation (Nu-12Gamma) and was given the name Helios. The terraforming process took over two hundred years to complete, the planet rather stubbornly clinging to its lifeless primordial past. 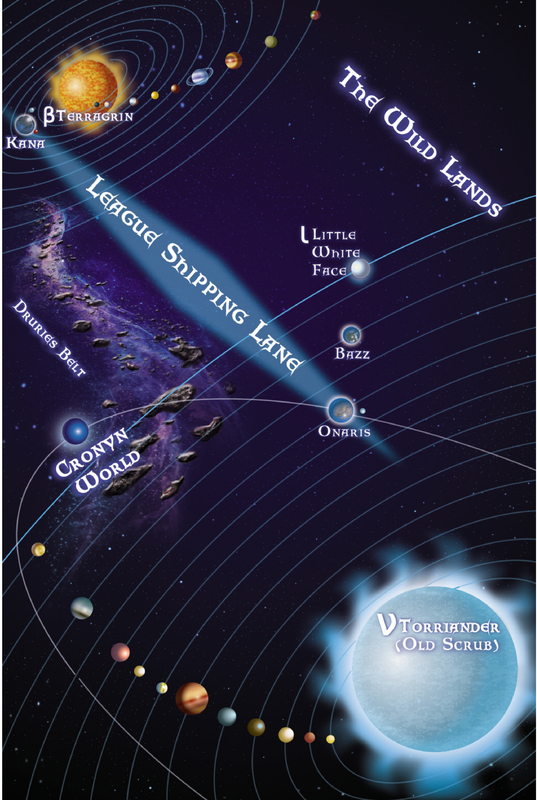 It is twelve stellar units from its parent star, Nu Torriander, or Ole’ Scrub as it is known on Onaris, its planetary sister-world. Nu Torriander is a blue super giant, and its habitable zone is much farther back than many systems supporting life. It also has a dwarf companion star known as Lil’ Whiteface. Bazz is known for cold winters and hot, humid summers. Those hot summers dissuaded the Vith, the usual explorers in the League and normally the first to populate a new world, from settling it. Helios sat empty for nearly three hundred years. After the Great Betrayal on 000000AX, it was occupied by the House of Sorrander for a short time. Eventually, Helios began attracting settlers, mostly tax exiles and other people looking to get lost. From the beginning, the settlers found themselves seeing and hearing things that weren’t there. It was believed that there was some sort of gas or nerve agent in the air causing the hallucinations, though nothing of the sort was found. Eventually the planet became known as Bazz, short for the Vith word for Bazzal, or “Nightmare” in the common tongue. The name “Bazz” was officially given to the planet in 000022AX. It’s capital city is Helios-Mason. Bazz, unlike Kana, Onaris and Hoban, never developed a feudal Great-House system of governing. instead, it developed a pure democratic system. For centuries, the place was considered barbaric and rather Xaphan-like. Its name became a metaphor for being rude, crass, noisy, profane and generally lacking in proper manners. As of late, its exotic culture, spicy food and distinctive architecture have given the place a new standing in the League. –All cities and villages on Bazz have two names. This tradition hails back to the antiquity of the planet. –Likewise, Bazzers also have two names instead of just one as seen in the Great House system. –Women on Bazz wear their hair with distinctive “sideburns” known as Mollucks indicating their marital status. Married women do not wear Mollucks. –Currency on Bazz consists of a computerized monetary unit known as a “Credit” or “Cred”. Bazzers transact business using a “Cred Stick”. –Bazz’ most popular hero in antiquity was Darius Jones, the “It ” man from the south. –The Hospitalers on Bazz are known as “The Jones” in honor of Darius Jones. –The symbol of Bazz is a ferocious bear-like beast known as a Gallian Torr, which is said to eat nothing but human flesh. LoE Book VII: Against the Druries will be available February, 2013 from Loconeal Publishing.